Customizable Design Grip WideBody® BIC® Ballpoint comes with contoured soft rubber grip. Promotional Design Grip Ballpoint is always available in stock. 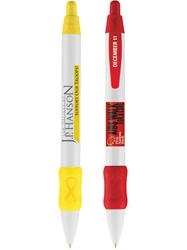 Customizable Design Grip WideBody® BIC® Ballpoint is available in 3 colors: Pink, Red, and Yellow.